In order to create relational databases, you need to be able to identify each individual entity in a table, and the way we do this is through a PRIMARY KEY. The primary key must be unique in that table. Each racer is given an ID number and that number is unique to the driver. 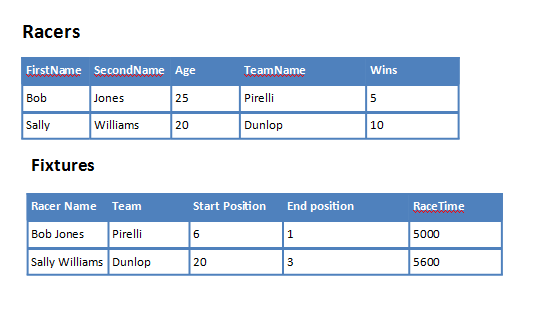 This means that even if there are 2 driver, who are both 25 and both work for Pirelli, they won’t get confused by the database. So why have we created a primary key in the first place? It’s more effort than before? Well, the answer is that we can now use the primary in other tables to refer to that racer name. It connects the two tables together and allows us to do more clever things with the database than we did previously. Here is a simple flat file database. 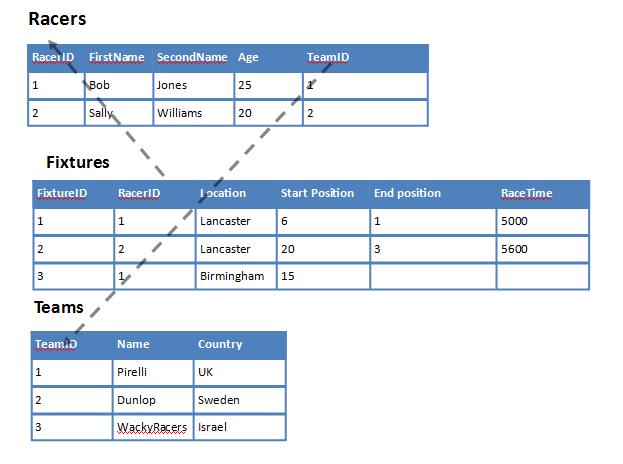 It looks pretty sound, but as you can see there is quite a bit of duplication between the two tables ( racerName, team). The more clever way of doing things would be to use a relational database setup instead, which would save duplication of data. Not only does this save on duplication, but it also avoids storing some data altogether. For instance we can calculate how many times a racer has won a race by doing a clever JOIN lookup on both the racers and fixtures tables.